My AirPods Won't Charge! Here's The Real Fix. You are at:Home»Help Articles»My AirPods Won’t Charge! Here’s The Real Fix. My AirPods Won’t Charge! Here’s The Real Fix. You put your AirPods into the Charging Case, but your AirPods aren’t charging. As you know, AirPods are designed to charge when you put them in the Charging Case, which is an amazing piece of technology in itself: It’s designed to hold multiple charges so you can charge your AirPods no matter where you are. 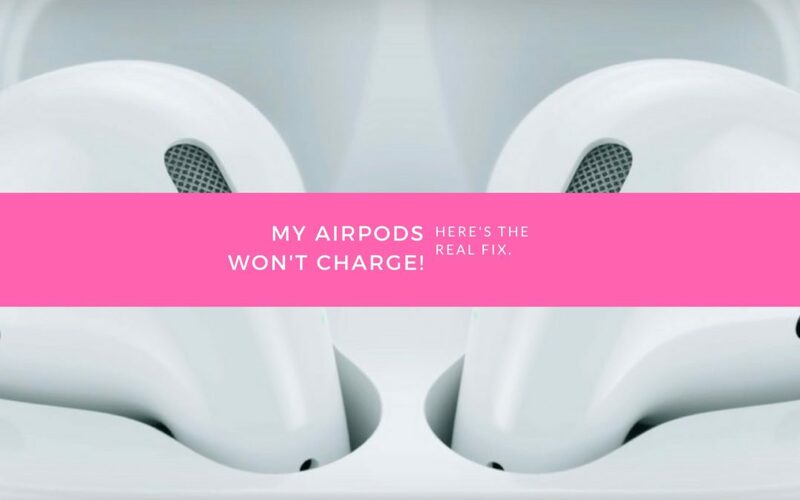 In this article, I’ll show you why your AirPods won’t charge and how to fix the problem for good. Are My AirPods Broken? Not Necessarily! Even though it may seem like your AirPods are broken, it’s just as likely that the Charging Case is causing the problem — or a faulty cable. The real cause of this problem isn’t always as obvious as it may seem. I’ll walk you through each piece of the AirPods charging process, and I encourage you to follow along as we discover why your AirPods won’t charge. The first two steps of the troubleshooting section are a simple review of how to charge your AirPods and the AirPods Charging Case. Sometimes the solution is as easy as double-checking your setup. After you’re sure everything’s set up correctly on your end, we’ll dive into the nitty gritty of fixing your AirPods charging problem for good. Charging your AirPods ensures that they will have enough battery life to function properly. AirPods are charged using the Charging Case. How Do I Charge My AirPods? Put your AirPods in the Charging Case. When your AirPods are in the Charging Case, the Status light will indicate the amount of charge your AirPods have. The Status light will turn green when your AirPods are fully charged. The status light will be amber when your AirPods have less than one full charge. The status light will flash white when your AirPods are ready to be connected to one of your devices. In a rush? 15 minutes of charge time will give your AirPods enough charge for 3 hours of listening time or 1 hour of talk time. It may be a mouthful, but the Charging Case needs to be charged in order to charge your AirPods. How Do I Charge The AirPods Charging Case? Plug a Lightning cable into the Lightning connector on your Charging Case. Plug the other end of the Lightning cable into a USB port or wall charger. It may take a few hours to fully charge your Charging Case. The Charging Case has a battery built in that charges your AirPods on the go. You can charge your Charging Case with or without your AirPods inside. Every new pair of AirPods you buy from the Apple Store comes with a Lightning cable and a Charging Case. If dirt, dust, or other debris gets into your AirPods or Charging Case, it can affect their functionality and cause hardware problems. For example, if there is debris in your Charging Case, your AirPods may not charge properly. How Do I Clean My AirPods and Charging Case? Get a soft, lint-free cloth. Don’t use tissue or cloth that will break up inside your devices. 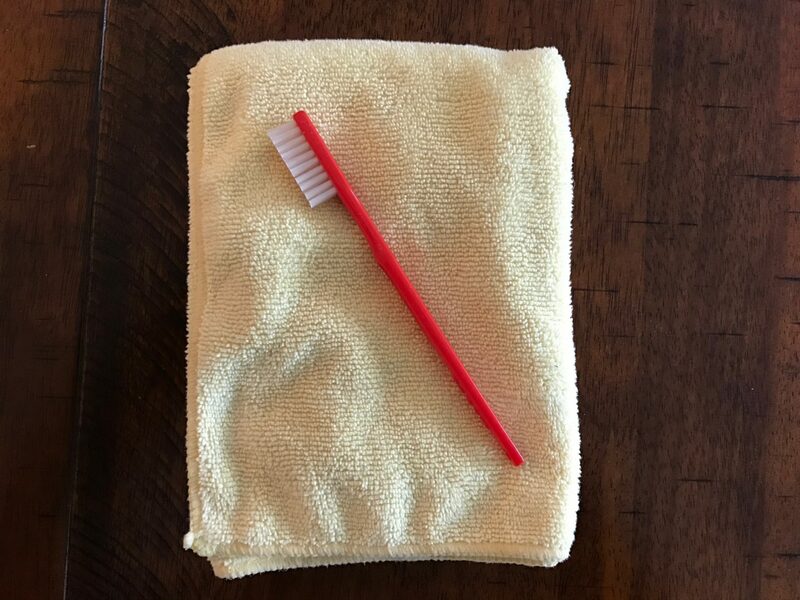 Gently wipe your AirPods and Charging Case with the cloth. For more compact debris, you can use a new toothbrush to brush it out. You should clean your AirPods and Charging Case regularly to prevent damage. Don’t get any moisture into the openings of your AirPods or Charging Case. Don’t use aerosol sprays, solvents, or abrasives to clean your AirPods or Charging Case. Just to clear up any confusion before we begin, Apple’s name for the iPhone charging cable is a Lightning cable. 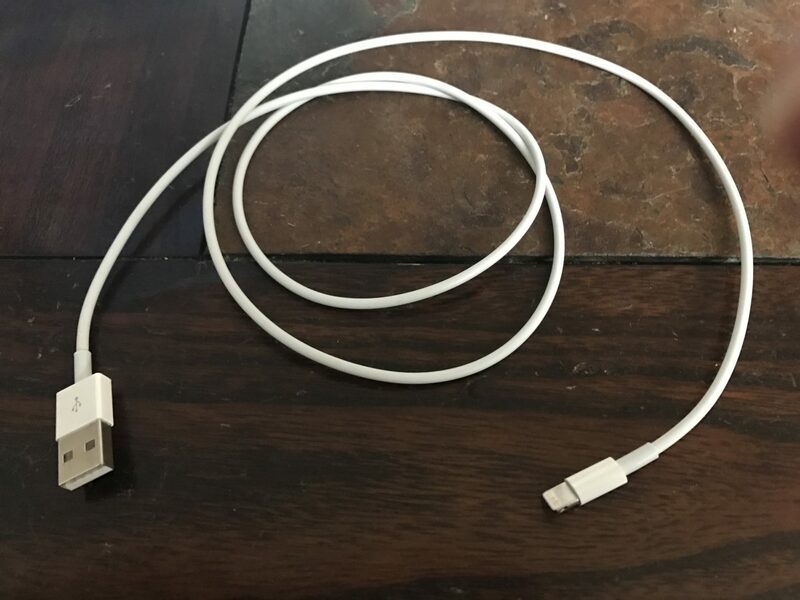 On one end, the Lightning cable has a Lightning connector that connects to the Lightning port on iPhones, iPads, iPods, and the AirPods Charging Case. On the other end is a USB connector that plugs into wall chargers, computers, and car chargers to charge Apple devices and sync them devices with computers. Why Should I Inspect My iPhone Cable (Lightning Cable)? Damaged Lightning cables are a common reason for iPhone problems, especially related to charging and transferring data between iPhones and computers. Lightning cables can be tricky to diagnose because when they start to go, they usually don’t break all at once. Sometimes an iPhone will continue to charge but won’t sync data properly, or vice versa, because of the construction of the cable. Make sure to take a close look while you’re troubleshooting! How Do I Inspect My iPhone Cable (Lightning Cable)? Use a flashlight and look closely at both ends of your Lightning cable. 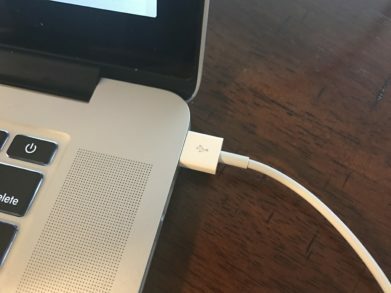 These cables can become worn and tend to fray, especially at the end with the Lightning connector. If you see no visible signs of damage, try charging your device using both a USB port on a computer and the wall adapter which came with your iPhone. If your Lightning cable works with one, but not the other, then your cable is not the problem. Try charging your device with a friend’s or family member’s Lightning cable. If their cable works while yours doesn’t, then you’ve identified that the problem is your Lightning cable. If your iPhone or other Apple device is still under warranty, your Lightning cable is too! You can make an appointment at the Genius Bar or set up an online repair for a Lightning cable, just like you can with your iPhone. Be very careful about buying low-quality third-party iPhone charging cables, like the ones you find in the gas station. Apple has a special MFi certification that you should look for before you purchase any non-Apple cable. Now that you’ve been warned about low-quality cables, there are high-quality alternatives to Apple cables. One of my favorites (and the one I use in bed) is this 6-foot AmazonBasics Lightning Cable that is less than half the price of Apple’s. It’s MFi-certified so you know it’s high-quality, and it’s backed by Amazon’s 1 year warranty. You should frequently inspect your Lightning port, also known as the charging port, to make sure it is clean. Lint, gunk, and other debris can prevent your Lightning port from making a solid connection with your Lightning cable. 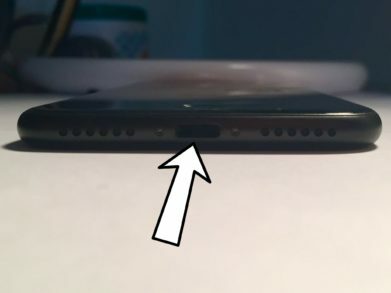 How Do I Inspect My iPhone's Charging Port (Lightning Port)? Use a flashlight to see if there is lint, gunk, or any other debris in your iPhone’s Lightning port. If you find debris in your iPhone’s Lightning port, gently brush it out with a new toothbrush or anti-static brush. Do not brush out your device with anything that will conduct an electric charge or damage the electronics in the bottom of your device. The Lightning cable has nine connectors. If any one of those connectors is blocked by debris, your iPhone may not charge at all. It’s may seem simple, but resetting your AirPods may fix minor software bugs such as connectivity issues or a quickly draining battery. Like resetting an iPhone, resetting your AirPods gives them a “fresh start”. How Do I Reset My AirPods? Press and hold the setup button on the back of your Charging Case. Release the setup button when status light flashes amber a few times, then flashes white. Your AirPods have been reset. 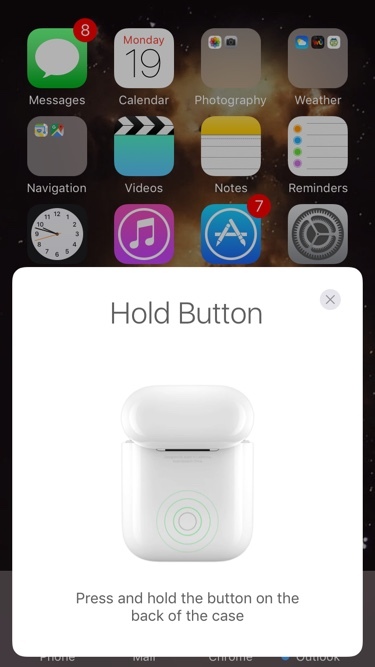 Connect your AirPods to your device, just like you did when you set them up the first time. Your iPhone needs to be connected to your AirPods before you can use them. AirPods are designed to easily connect to your iPhone as soon as you open the Charging Case. How Do I Set Up AirPods Using My iPhone? Open the Charging Case with your AirPods inside. Hold the Charging Case next to your iPhone. A setup animation will appear on your iPhone. AirPods connect to your iPhone using Bluetooth technology. At this point, Apple is the only place in town that can repair AirPods. So, if your AirPods are broken, you have only one question to ask yourself: Do I visit the Genius Bar at an Apple Store to repair my AirPods or do I use Apple’s mail-in repair service? How Do I Repair My AirPods With Apple? 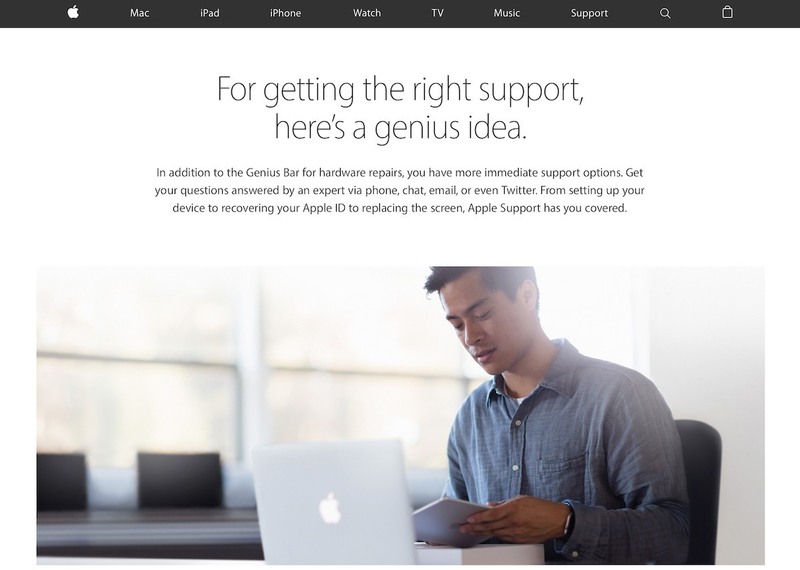 Visit Apple’s website to make an appointment at the Genius Bar at your local Apple Store. Make sure to check in at the Genius Bar when you arrive. 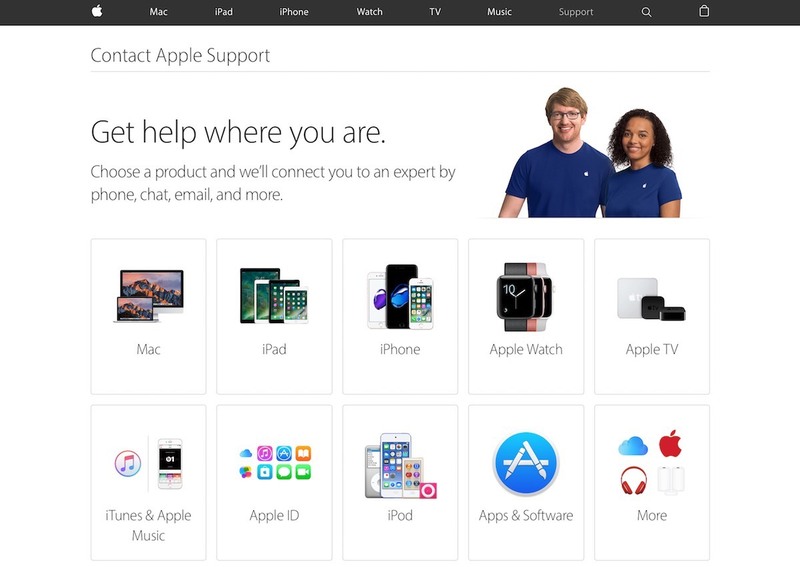 Visit Apple’s online support website to set up a mail-in repair or get phone support. Before you set up a repair through Apple, check to see if you’re within still within the return period of the store where you purchased your AirPods. If you are, going through the regular store exchange process is usually quicker than going through Apple’s repair service — as long as they have the AirPods in stock. Your AirPods are charging and you’ll be listening to your favorite music again in no time. Now that you know how to troubleshoot AirPods that won’t charge, you’ll be able to avoid the problem in the future — and help your friends when they have the problem too! Thanks for reading our article! Don’t forget to share this article with your friends, and feel free to share your thoughts with us in the comments section below. Previous ArticleMy iPhone 7 Won’t Ring! Here’s The Real Fix. Next Article My iPhone 7 Plus Is Not Charging. Here’s The Real Fix!